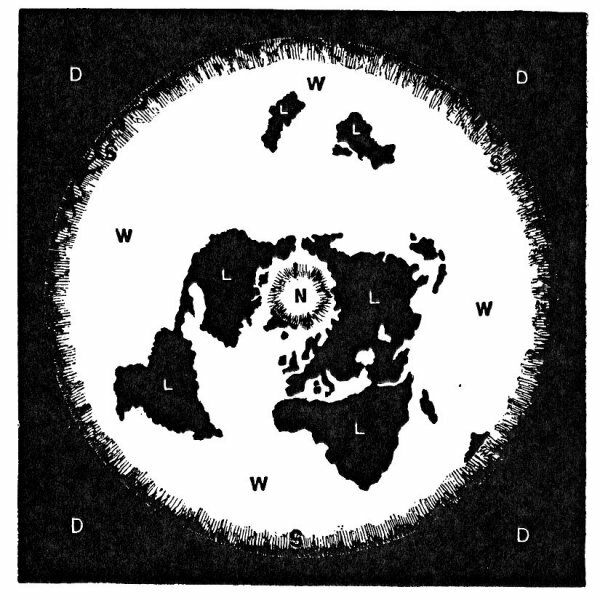 image 1: top view of the Zetetic flat Earth In his book Zetetic Astronomy, The Earth is not a Globe, the author Parallax(Samuel Birley Rowbotham) goes into fairly detailed arguments as to why we are actually living on a flat Earth, just like the ancients and their scriptures have always said. He also provides some helpful diagrams, such as the ones here, showing a bird's eye view of the flat Earth plane(above). as well as a cross section of same(below). 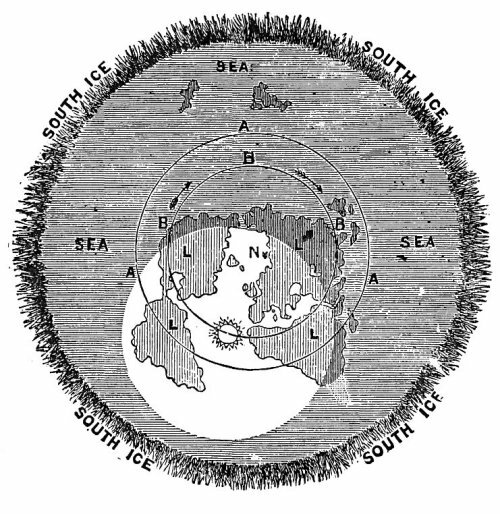 In diagram one we see the Earth's continents spread out across a flat plain bordered by seas and ice. In the central North(N) there is a polar sea some 1000 miles wide surrounded by an ice wall about 80 to 100 miles thick, and in the peripheral South(S) we see another ice wall whose circumference is some 52,800 miles. 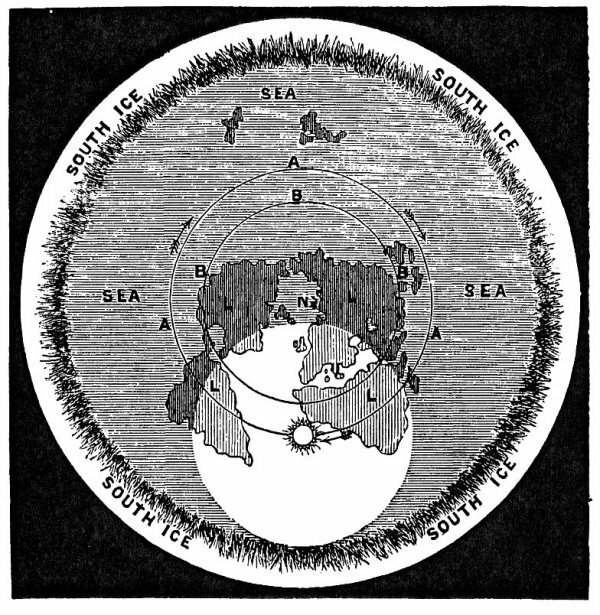 The radial distance between the inner center and outer periphery(Ross ice shelf in particular) is estimated to be some 10,400 miles, which would make the diameter of the flat Earth proper at least 20,800 miles. At some point beyond the outer ice shelf is the Earth's dome which is embedded into the ice and reaches upwards anywhere from 700 to 1000 statute miles at its center. The Sun, Moon, planets and stars are also located within this range. There is not much on the dome, but the Sun and its movements producing the seasons and night and day is discussed at length. Images three and four show how the Sun moves above us concentrically producing night and day. They also show the Sun's variation in orbit(A=Dec.21st and B=Jun.21) producing the seasons. Heat increases as you go deep underground leveling off everywhere on the planet at 50 feet below sea level. Heat increases abvout 1 degree every 15 yards. It's 70 degrees Farenheight at 300 yards and 77 degrees at 400 yards deep. It's 116 degrees at 1320 yards and 212 degrees(boiling point) at 1.87 miles deep. At 12 miles or deep there is hot shining magma which occasionally finds its way up through volcanoes. Then it cools off again into solid rock. Is this the "lake of fire" mentioned in the bible? Image 5 shows this. The entire Earth plane or landmass floats on water or the "Great Deep", the depth of which is unknown. Not much else is known that can be verified or concluded beyond that by the author.